Get a glass jar that holds ¾ gallons to 1 gallon of water. You might obtain a free one at your local health food store—their discarded olive or pickle jars will do the trick. You can purchase one for about $10 at a kitchen supply store. Brew the tea. Pour hot filtered water over 4-5 green tea bags or the equivalent of loose tea. Organic is better because anything added to the tea leaves to kill pests can also kill your culture. Add 1c honey and mix well. Only use honey. That’s what the jun culture is adapted to. Let the sweetened tea sit until the temperature is comfortable to the touch—usually I let it sit overnight. If it’s too hot, you’ll cook your mother: she is alive! Strain out the tea leaves. Put your SCOBY mother (Symbiotic Colony of Bacteria and Yeast) on the top of the culture. She might float down to the middle of the jar. That’s okay. Add ¼ to ½ cups (I just throw in a good sized “glurp”) of starter jun liquid, from your last batch. You can add even more if you want. Using starter liquid from your last batch helps create a pH environment that is inhospitable to molds, so if you have had mold trouble with other ferments, you might want to use more starter. My latest Jun mother, aka SCOBY (symbiotic colony of bacteria and yeast). This one formed in 8 days. Cover it securely with a towel. You want it to be able to breathe, but you also don’t want bugs to get in. I suggest securing it with a couple of rubber bands. Leave it in an out-of-way place, out of direct sunlight for 1-3 weeks. After 1 week, taste it. If it’s too sweet for your liking, then it’s not done. Put it back and let it keep going. If it’s too sour, you let it go too long. It’s still okay, just not as pleasant. Batches will ferment faster in warmer temperatures. When the batch is done, you will notice that a new SCOBY has formed at the top of your jun liquid. Now you have two mothers. You can save one as a back up, give it away, compost it, or look for other options: if you look online, you’ll find people who have developed recipes for SCOBY (eeeeww). I’ve also heard of people drying them and turning them into fabric. You can leave your finished jun in a big jar, or you can bottle it. Bottling the jun will help it to build up more bubbles, because you are not constantly opening and closing the same container and the pressure can build a little. If you are bottling, this is also a good time to flavor it. A few pieces of chopped ginger will make an extra fizzy one, or you can add other herbs. I like to use a few dollups of frozen juice concentrate (my favorite lately is pineapple). Edible aloe vera can make an interesting addition to your jun cocktail as well. Once you have bottled your Jun, you may leave it out for about a day, especially if you have flavored it, to create a secondary ferment which will let the flavors sink in and build up bubbles. Soon, you will want to put it in the fridge, to slow down the fermentation process, or you’ll end up with a super sour and potentially explosive brew (see Cherry Explosion). Make another batch! If you wait in between, you can store your SCOBY in a little bit of jun liquid, sealed in a jar in the refrigerator. She will lie dormant until you are ready to rock. You can also store her at room temperature in a little liquid, with a towel covering the container. This is what has been referred to by fellow fermenters as a “SCOBY hotel.” If you leave her at room temp, she will continue to grow, so you should check periodically to make sure that there is still liquid in your hotel. 1. It’s a pretty no-fail recipe, but sometimes things can happen. If you see mold growing on your mother THROW IT OUT! If flies invade, throw it out. But, if there are little brown strands hanging off the bottom of your mother, or if the mother has air bubbles in her, it’s okay. 2. Jun, like kombucha and tibicos, will corrode metal. If you handle your Jun brew or SCOBY intermittently with metal implements such as a fork, or a metal strainer, that’s okay. You do not want it in prolonged contact with metal, or you will both contaminate your SCOBY mother and ruin your metal. You probably don’t want it in prolonged contact with plastic either. I can just imagine what creepy chemicals that would leach out. 3. What does it taste like? My Jun has a ‘lighter’ taste than kombucha, perhaps more astringent. If you let it go too long, I think it gets even more vinegary than kombucha. Sorry I can’t be more specific– I don’t have the language of a wine connoisseur. 4. What’s the difference between kombucha and Jun? Kombucha is a culture adapted to fermenting tea and sugar, whereas Jun takes green tea and honey. That’s the big difference. I’m sure a bioscientist could tell you more specifics about the organisms in there. I have found that my Jun tolerates cooler brewing temperatures better than kombucha in the winter, and it will grow a thicker SCOBY more rapidly. Jun also tends to develop more sediment than Kombucha at the bottom of the bottle. This is the lees, in brewers terms. Lees forms in wines also. You can drink the sediment or filter it out. The batch after I bottled most of it. Notice the cloudiness at the bottom of the bottle, from the sediment. ← Cherry Explosion (and a new recipe)! sells many live cultures and has a great reputation. I recently purchased both cultures and they are presently brewing. I have had previously experience brewing Kombucha and there seems to be a noticeable difference between the two. Hopefully this will shed come light onto the idea of “converting a kombucha culture to a Jun”. If you contact her, I am sure she would be happy to answer your questions about the 2. To confirm, your Jun culture is not a kombucha scoby simply adapted to green tea and honey? Sarah, the cultures are similar in how they work, but they are two distinct cultures. I have heard of people who try to turn their kombucha into a Jun culture, but it’s not something I have bothered with and would not recommend. I received a jun culture from you a few months ago. Sadly, it did not survive the travel and caught mold – something that has never happened in my two years of making kombucha. I then made a new green tea+honey batch and put a kombucha scoby in it. It turned out wonderful. I have since done a little research on jun, not much is found on the internet, but I did gather that it is actually very different from kombucha. The fermentation process is also different, it is anaerobic. I believe what you have is not a real jun, but instead a kombucha that uses honey and green tea. Kombucha is supposedly thousands of years old, they did not have refined sugar back in the old days. I’m sorry to hear that the culture I sent you caught mold. I haven’t ever had this happen to my cultures at home, and this is the first instance I have heard of this happening to a culture I’ve sent out. I would be happy to send you another one if you are still interested in trying it out again. Are you Gordon Fagras? I think I still have your mailing address if so. As to the “what is real Jun” debate, I would say that there may be another ferment out there called Jun that has an anaerobic fermentation process, and if so it is not being shared readily. I do recall reading some hint of this on the internet myself but without much information backing it up. Most of the information I have found on Jun is about a culture that behaves like mine. If my Jun came from a kombucha originally, then it has had some years to make itself into a distinct culture of it’s own and I can say that my Jun ferments and grows at a different rate and thrives in a different temperature range than my kombucha culture. I’ve recently been reading Gunther Frank’s “Kombucha” book, and he talks about how there is not one kombucha culture, but there are many, and they vary depending on factors such as geographical and climate conditions, and what types of yeasts and bacteria are existing in the kombucha’s local environment. My Jun and my kombucha are in proximity to each other and the difference in their rearing is that the eat different sugars…. Because I find them distinct, I prefer to call my Jun by that name and recognize that it is different than my kombucha. If there is another Jun out there and you get your hands on some, share it with me! This is an interesting article, and something that I’ve heard implied before: that unadulterated Jun has no yeast in it. My Jun probably has some yeast as it does ferment open to the air and to wild yeasts– perhaps this is why “true jun” is supposed to be an anaerobic ferment. Anaerobic Jun, then, would not be a SCOBY, as that means symbiotic colony of bacteria and yeast. Hmm. In regard to the anaerobic Jun discussion. I now have three Jun from three different sources and they reportedly are true Jun. I just recd #3 and it is traced back to one very reputable well-published gentleman from the South. I ferment anaerobically, underwater filled airlock. Yeast can & do reproduce and function in an anaerobic environment. My first Jun was split into four same weight pieces and I brewed four equal batches, two aerobic, two anaerobic. One aerobic/anaerobic were at 74F while the other ran 67-69F. None of them behaved like a KT scoby in terms of yeast threads, etc. The aerobic ones develop new scoby much faster, yet the anaerobic ones develop happy, healthy scoby also. Obviously aerobic exposure is more likely to pick up wild yeast(s), but we would not know if those yeasts have impregnated the Jun DNA unless we had lab confirmation. There is always that chance that the alleged bacterial makeup of Jun prevents the wild yeast from ‘infecting’ the scoby yet the yeast may be present just in the liquid. My preferred Jun is anaerobic and cool temp. I have never developed mold even at a cool temp, though KT at this cool temp commonly molds especially in the absence of oxygen. These attributes point out to me that Jun is quite different from KT. I encourage everyone to try an anaerobic ferment with Jun, even inFido-type jar if that is all you have. The cool temp also allows a longer ferment time, instead of the typical 4-5d most Jun brewers experience. I have also found an aged Jun is delicious, just finished a bottle which had been aged for 60-days and in early December I will open my 90-day bottle. Still as good as the first sip with definite honey profiles on the palate, balanced well with the present acidity, slightly effervescent. So far Brooklyn Alewife’s Jun matches my first Jun, and I look forward to comparing #1+#2 to #3. I have spoken with several professional culture-related individuals and they all agree that Jun is NOT kombucha and that it is an aerobic or anaerobic culture with a tolerance for cooler temperatures. Eventually, I will get my Jun cultured and organisms identified, may need to take up a collection in the name of home fermenters everywhere but even then my culture results will quite likely be different than yours because there are many Jun circulating that started as kombucha only to be lovingly dropped in green tea and honey and declared to be Jun. Several popular blogs even tell people to make Jun this way!! We need to keep Jun as close to its original, if only Herbal JUNction in Eugene, OR would share their research data from John Hopkins. If looking for the proper term for the Jun ‘solid disc’ it is actually a ‘pellicle’. Kombucha, Jun, vinegar and several lactobacilli all form pellicles. Obviously anything comprised of a ‘symbiotic colony of bacteria & yeast’ can take the shape of a pellicle or even the form of water/milk kefir grains or true ginger beer plant—all bacteria & yeast, but their scoby takes different forms, yet interestingly they can and do develop a pellicle shape at times. Thank you Sarah, for your insights and your research on the subject! I think I will do a separate blog post that highlights your comments sometime soon. Andrea, I charge $10 to ship SCOBY domestically. I am backed up right now in production because I had a surge of interest a few weeks ago due to a jun article in The Nourished Kitchen blog, but I could add you to the waiting list. It would be a few weeks. If you are interested, send your mailing address to my email, brooklynalewife@gmail.com. I will paypal invoice you when your SCOBY is ready. Many people propose a trade, and I am open to this as well. I thought I already replied to this, but not sure…. If you are interested in purchasing a Jun from me, you can email me at brooklynalewife@gmail.com. I have a fresh one ready to send out today, if you email me with your address. I ask for $10 to cover shipping and material costs, which people usually pay via paypal, but I’m open to checks in the mail or trades as well. I’m not sure if those microbes (bacteria/yeast/whatever else) in the scooby allow other microbes to populate and live symbiotically. It almost seems that they are evolved to protect each other. It is also hard to say if we really are aerobically fermenting. The scooby on top, once it grows the size of the container, could be attempting to block out all the oxygen. Hard to say for sure without a dissolved oxygen meter. I have a question that I think someone should be able to answer – Does it matter what temperature the water is when the honey is added? Will honey’s natural enzymes slow down the scooby growth? Sarah – Have you played around humidity to see how that affects growth? Have you tried Adele’s culture? My only Jun experience is drinking a bottle of Healing Springs Jun from Middletown, CA. I was almost falling asleep in my chair and then I took a couple sips and felt overwhelming burst of energy. It says they use unrefined cane sugar which really confuses me. I have contacted the owner and he claims that leaving a bottle open with a cheesecloth or similar over the top for a week at room temp will start to form a culture. I plan on eventually buying a bottle of all the commercial produced Jun/Ling and comparing them. I’m calling BS on all the manufacturers that claim the culture can’t be reproduced… what are you guys cloning your microbes…? Possible, but I don’t buy it. Yes I do believe that some of the brewing processes would be hard to replicate when it comes to organizing water structure (vortex), adding crystal energies, rock minerals, infusing herbs, alchemy, etc. The guy from ling elixirs tried to sell me a culture for $500. I almost bought it but I enjoy doing scientific research and breaking down the truth. I don’t really care who’s right or wrong… I just to be able to drink what I drank everyday and have the energy to run circles around everyone around me..haha. Bout to get this discussion heated up. It is true that the amount of micro-organisms in the culture are pretty strong and do tend to overpower other organisms in the area. I think that it is possible within one batch, however, depending on the temp of your culture and other factors, to encourage either more yeast or more bacterial growth. There was a site I found a while ago, in my archives called “kombucha, the great balancing act” that talks a lot about this. On the temperature that you start your Jun at: never put your Jun Scoby in boiling hot water, or anything that would be painful to your touch. You don’t want to cook it. By the time it is “blood warm,” the liquid is safe to add to your culture. When you add the honey is another question: I have added honey to scalding hot water, so maybe it is no longer raw when it meets with the Jun. The whole point of Jun, however, is that it is adapted to cope and in fact thrive with all microbes found in honey. As for the temp you ferment at: my kitchen is very hot, like 100 degrees often in the summer and pretty cool, sometimes as low as 60 degrees F in the winter. In summer, everything matures faster. Winter temps significantly slow down my kombucha ferments but Jun is quite tolerant of this entire temperature range. As for the anaerobic/aerobic environment, even if the scoby is creating a seal at the top of the jar, keep in mind that the colony itself is open to the air and breathing, unless you are containing it in a sealed bottle with an air lock. I use anaerobic fermentation in sealed bottles frequently for my secondary fermentation process. When working with tibicos in particular, this anaerobic ferment produces more alcohols and less vinegar in the ferment. 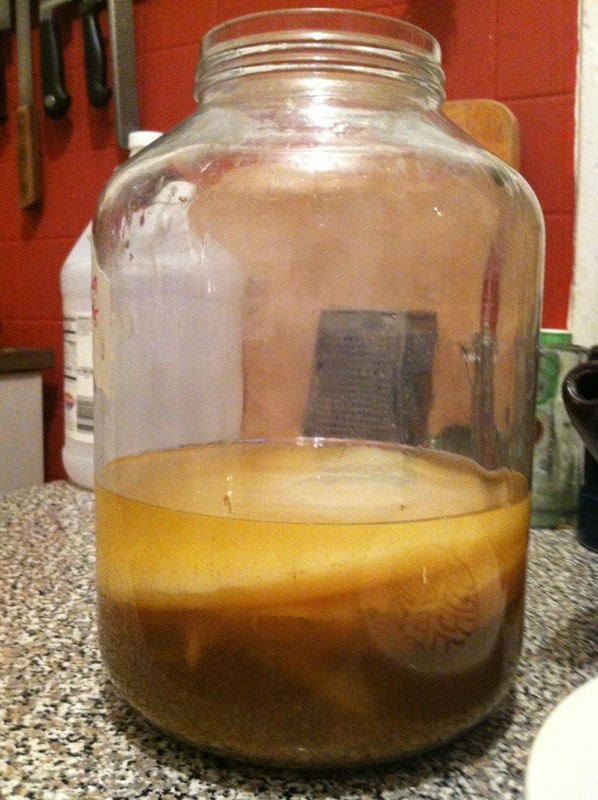 My understanding of all of my cultures is that the scoby itself needs to breathe, but I have read of people doing anaerobic primary ferments with tibicos for sure, and now Sara says she has made my Jun anaerobically… interesting. I wouldn’t trust someone who charges you $500 for a culture! That’s crazy. As for adding crystal energy, I know some people vibe on that (pun intended) but that starts to look a little flaky/new age to me. As for herbs, they are pretty easy to infuse to a secondary ferment and are a great way to add flavor and added health benefit to your brew. You just have to do a little research to understand the safety of the plants you are using. Oh, also it’s scoby with one “o”. Scooby is a crime fighting dog. Scoby is a Symbiotic Colony Of Bacteria and Yeast. And now we have another name for it: pellicle. Unlearning–I have not experimented with growth of the Jun culture as it relates to humidity. I do ALOT of control experiments but humidity monitoring -cause & effect is not anything I plan to delve in to. One big reason is because the average home fermrnter is not ever going to go there. Do I feel there is a relationship between humidity and culture growth? Absolutely, my microbiology classes taught me that. I found it interesting that Healing Springs is marketing Jun yet does not use honey, yet some of their kombucha uses honey. My Jun experiments have included use of several sugars and the cultre flourishes, it even reproduces in honey water and that new scoby mimics its mother when introduced to green tea- honey solution. But only the use of honey yields the superb taste and quick effervescence. Oh, and I do have one of Brooklyn Ale Wife’s JUN cultures. It is thriving beside my other two. I have just finished my first batch of Jun. It is bitter. Is that normal?? Ginna- I would not usually characterize jun as bitter. More like sweet and sour. What kind of tea did you use? Perhaps you are tasting something in the flavor of your tea. Thank You for your help. I used a good green tea–Green Goddess(100% Organic) and brewed at 165 degrees for 2 minutes. The bitterness did not seem to be a tea characteristic. The finished Jun was less bitter. I just received my Jun SCOBY!! It was so healthy, and it made it all the way to Scotland just fine – a week later I’ve got a mother and a bottle of Jun. I heard once you try Jun, you’ll never go back to kombucha… I know why now. Thanks a million for this fantastically healthy Jun SCOBY! Thanks for letting me know! I’m glad it arrived safe and healthy. Enjoy! I recently purchased a Jun tea scoby. I found the information you provide on your website very helpful! Thanks! Thanks for telling me, Carl! I’m happy I could help. I am having difficulty believing any true jun culture will produce a pellicle stable enough for sharing in a mere 8 days. That is the behaviour of a kombucha Scoby. At the same time I doubt there is any true jun available for sharing with so many kombucha Scoby converted to “jun” being passed on as jun, knowingly or unknowingly. Seahare, I generally wait about two weeks to brew a good size new pellicle for sharing. I find that my jun culture actually grows faster than my kombucha. I believe it is a distinct culture, although there could be something else out there that some identify as a “true” jun. Do you have a culture that you consider true jun? If you do, I’d be willing to try it out. I am really enjoying your information as I am just starting out with Water Kefir Grains, Jun and Kombucha – all at the same time! I have been over run with Jun cultures but Kombucha seems to grow much more slowly and I have thrown two out with mould. 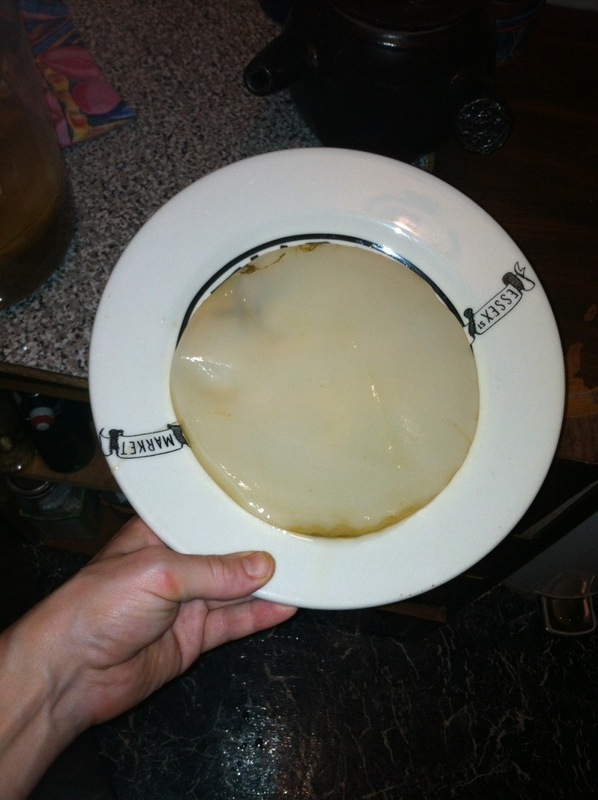 I have now changed the location of where the Kombucha was growing to see if that is the cause of the mould. My Water Kefir Grains are also growing so rapidly I don’t know what to do with them – giving loads away!